Samsung has been rather quiet on the Galaxy S II front in recent times, but just as we expected a flurry of news has come our way which could spell the near-launch of the handset sometime in the close future. One of those reports suggest that AT&T could be set on releasing two versions of the Galaxy S II, with one of them including a slide-out keyboard. A set of new images have been leaked today that show the QWERTY slider in a real-life setting. Along with that, we also got a one other photo that shows a Galaxy S II phone, but without the slide-out keyboard attached. Things are getting rather curious, are they not? The image above is the first of the new set of images to appear on the internet. The slide-out keyboard can be seen clear as day, although the image is pretty low quality, you can make out the Android buttons situated either side of the keyboard that link directly to the ones that would be used under the screen if it was tilted in a portrait fashion. 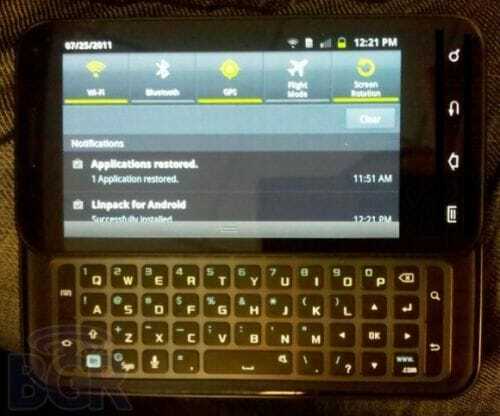 Another photo has surfaced online that shows a Galaxy S II phone, but without the slide-out keyboard attached. From this, we can only guess that both of the models will come to AT&T soon, although no official carriers have yet been confirmed. This claim of an AT&T launch is also backed up by the fact that if you search the Samsung U.S. website, you can find evidence of the Galaxy S II (see here), it clearly says “Sign up to get the latest on the Samsung Galaxy S II“, however all of the links are dead, perhaps these links will go live in the coming days. We looked around but there was no sign of the model which features a physical QWERTY keyboard, however this may show up soon. If a Samsung Galaxy S II does hit AT&T boasting a physical QWERTY keyboard it could be seen as a direct competitor to the Motorola Droid 3, currently it would be fair to say that AT&T are lacking in regards to high-end smartphones which feature QWERTY sliders, perhaps this is a void which the Galaxy S II slider could fill. What do you think?